Mickey Stones believes Horncastle Town’s 2-0 defeat at Immingham has summed up the Wongers’s season. Andrew Bullivant saw a penalty saved as his side trailed 1-0 at Blossom Way, the hosts adding to their tally to claim the three points. “It’s a game we should have won. It sums our season up, basically,” said manager Stones. “We created good chances, looked good defensively but couldn’t score goals. “When we didn’t convert chances they put pressure on us at the other end. “Their supporters gave their keeper man of the match afterwards, which sums it up. 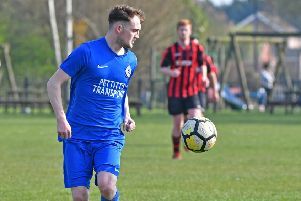 Stones conceded that a goalscorer may be top of the side’s wish list this summer as they drew a blank at Immingham in a game where there were enough chances for both teams. “It’s something to look at for next season, we need a bit more firepower,” Stones added. “They had chances at the other end as, when we went forward, they looked to break.